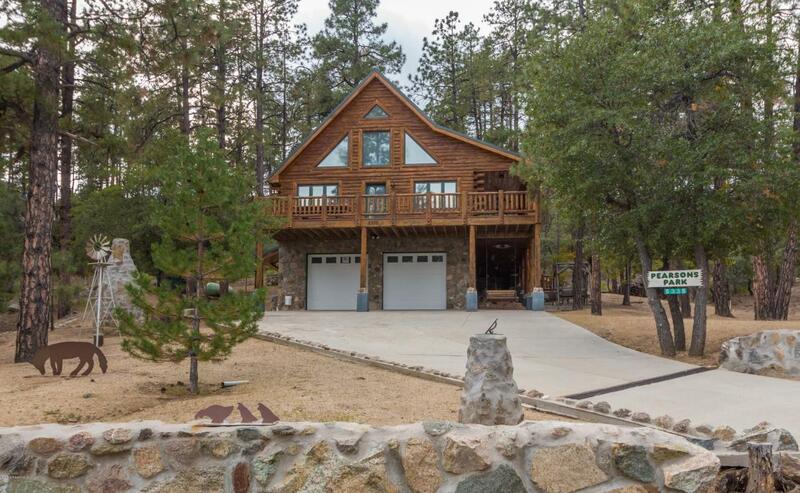 PERFECT GET AWAY nestled on 2.28 pine treed acres in the quiet pines 1,000 ft higher than Prescott and only 10 minutes from downtown. HAND CRAFTED LOG HOME with BRIGHT open floor plan. Oversized DECK to enjoy gorgeous sunrises, mtn views which include Thumb Butte and the night lights of Prescott.IMMACULATE multi-level with Master on main w/large walk in closet and full bath.Also on main is the Bright open kitchen,pantry, informal dining, good sized laundry and 1/2 bath.wood stove. Solid OAK flooring and some carpet. Landscaped front yard, volleyball court and horseshoe pit. Back yard has 4 apple trees, a plum tree and a TREE HOUSE. 2nd floor has 2 bdrm, bath and large loft overlooking the LR. 2 car garage has 245 sq.ft workshop/game room and a full bath.All 3 floors have A/C and heating.